First off, I'd like to personally welcome you to THWACK. I'll start off with a brief introduction of who we are then we'll jump right in. Maybe you've heard rumblings of THWACK, or perhaps this is your first time hearing of us. Whichever the case may be, I'm sure there's one question standing out in your mind: What is THWACK, and how does it benefit me? Simply put, THWACK connects you with more than 130,000 IT professionals and community members, who've contributed to help us make superior products, provide educational IT content, and, most importantly, help IT professionals do their jobs better. Here we put you in direct contact with the people who manage and develop our products. THWACK is a place where you have a say in the direction of those products, and where you get support and answers, on the fly, without having to pick up the phone. Crazy, huh? A company that actually listens to their customers. We can't believe you're just now getting here! Without further ado, allow me to show you what you've been missing. With almost 15 years of content, THWACK can appear daunting to a first-comer. To ease the learning curve, we're going quickly to guide you through some of the most important pieces of the site. 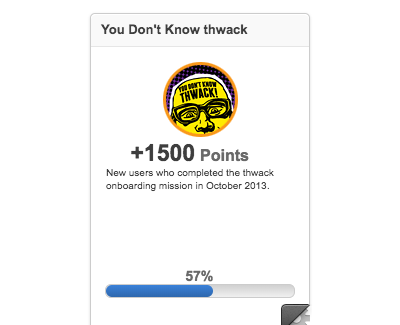 Along the way, you'll earn points, including a quick 1500 bonus points for completing this onboarding mission. You don't need to complete these tasks in one sitting, or in any specific order. Feel free to come back at your convenience. Have a customer portal account? Link your THWACK and Customer portal accounts to earn an additional 2,000 THWACK points to spend in the THWACK store! Plus, you'll get great benefits like seeing the products you own on your THWACK profile, seeing your renewal dates, renew licenses, open support tickets, reviewing existing support tickets, and you'll gain more visibility and access to betas for the products you own. Task 1 - How do you create an account? No, we won't spam your inbox or add you to any marketing list. Having an account simply allows you to contribute and take advantage of all the features on the site. This should take less than 5 minutes of your time. To create an account, find the "Register" link on the top right-hand corner of your screen. If you already have a THWACK account, you do not need to create another one. You will need to be logged in in order to complete the rest of the tasks. Task 2 - Where can you find content to extend your product's capabilities? Here on THWACK, you'll find thousands of downloadable templates, reports, scripts and more that allow you to customize and extend our products. 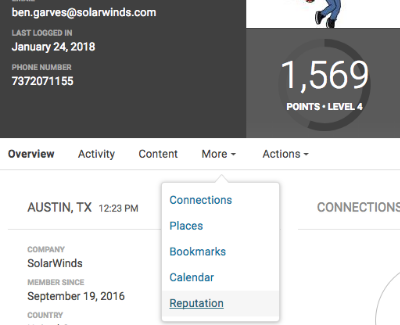 Some content in this area is created by SolarWinds employees and the rest has been created and shared with the community by our members. For this task, navigate to the Content Exchange. To get there, you first need to go to the Product Forums button in the top navigation bar (under "Product Forums"), choose the product you're familiar with, and select content that suits your needs. From there, browse through the documents until you find something that sparks interest. Next, download the template, report, script, etc. that you've chosen. You can then plug this item into the product which ultimately extends the functionality that is provided out-of-the-box (plugging the downloaded item into the product is not required to complete this task - however, we do recommend you check it out when time becomes available). Task 3 - How can you influence the direction of a product? As mentioned earlier, we greatly value customer input, and will gladly review requests for new features. Here on THWACK, you can submit an idea or feature request for a future implementation. Product Managers pay special attention to this concept of "ideation" and, to gauge interest, we allow community members to vote on feature requests. There are 5 stages in which an idea can be slated for. When a user creates an idea, it is placed into the "Recent" stage. The Product Manager then reviews the request and will move the idea into 1 of 3 stages - Open for Voting, What We're Working On, or Closed. If an idea is placed in the "Closed" stage, it means the request is either unfeasible or doesn't fit with the direction of the product. The last stage is "Implemented" which means the feature has been added to the product. You can read more here about the recent features that were added to our products because of the crowd-sourcing feature on THWACK. 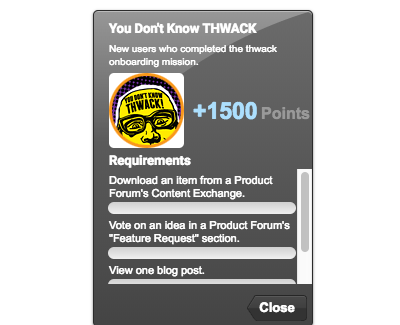 For this task, navigate to a product feature request forum. Choose a product you are familiar with from the Product Forums in the top navigation bar, then click on Feature requests. You'll then be dropped on a page which showcases the "top ideas" for that product (choose "show all" at the bottom of the list to see all ideas). Find a feature request that would bring value to your environment and vote for it. Task 4 - Where can you get support while troubleshooting an issue? The product forums are where you will get most of your support, from either other community members or a SolarWinds employee. There are developers, product managers, community staff, and others that are here to answer your questions and help resolve issues. For this task, navigate to a product forum. There is a shortcut to this area at the top of your screen, look for the tab that reads "Product Forums". Choose a product you are familiar with the drop-down menu, then click on Content. There is an exceptional amount of content in most of our forums so please take a minute to click around. Find a discussion thread that sparks your interest and "like" it. Task 5 - Where can you find product roadmaps? In the top navigation, look for "Resources". Within that parent, you'll see the Blogs category. 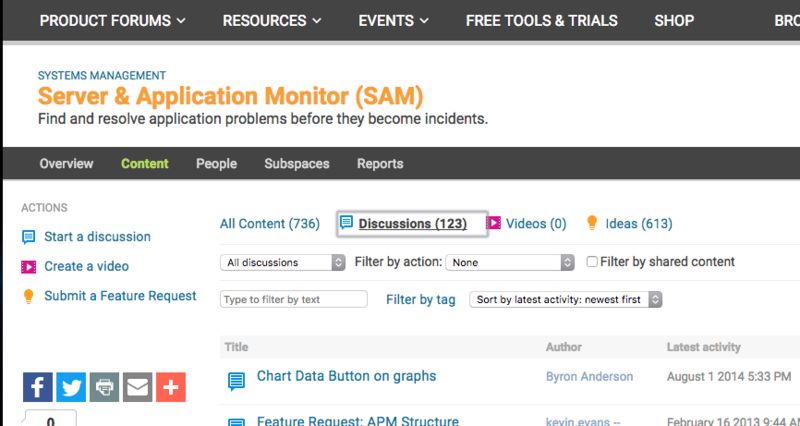 SolarWinds has many blogs, and we'll talk about them more in-depth in Task 6. Select the "Community Announcements" blog.This post stands as a guide to what the teams are working on for each of our products. Once you've found the guide, bookmark it. Bookmarking a piece of content will place it in your bookmarks, which can be found by clicking the magnifying glass in the navigation menu, and selecing "Bookmarks". Task 6 - Where can you read blogs about SolarWinds products and other general IT topics? 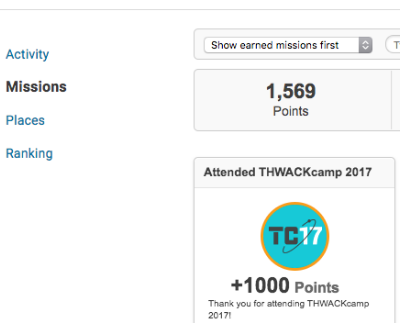 We have several blogging areas here on THWACK, but four main blogs. For this task, let's focus on three specific blogging areas: Product Blog, Monitoring Central, and Geek Speak. First, navigate to the Product Blog. You can get there by hovering over "Resources" in the navigation and, under the "Blogs" category, selecting "Product Blog". You can also reach the product blog for any specific product by going to their product forum and selecting their Product Blog option in their list of buttons. Some of these blog posts may look familiar because they're streamed into our products. The rumors are true. They come directly from THWACK. Click on a blog that interests you and take a minute to read. Make sure you click on the blog subject line for the action to be recorded. Second, navigate to Geek Speak. 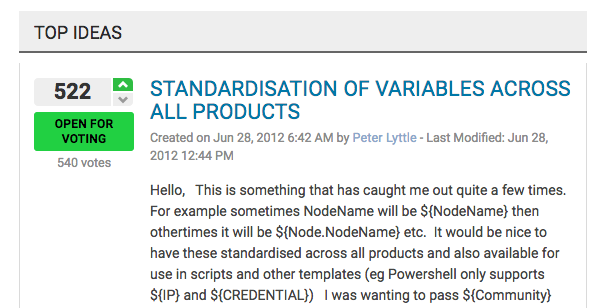 To get there, hover over "Resources" in the navigation and, under the "Blogs" category, selecting "Geek Speak". Again, choose a post to read. Make sure you click on the blog subject line for the action to be recorded. You want to see which tasks you still need to complete? No problem! Go to your Profile - More - Reputation - Missions, and just look for this particular mission. Once you click on the wheel in right corner, you'll be able to track your progress, based on the bars displayed in the same order as listed in the onboarding mission. Depending on the completion of a certain task, you'll see either a blue bar (complete) or a white bar (to complete). Library & Support - Documentation, video tutorials, and other helpful content divided by product. Groups - Participate in RC or beta builds and work directly with the PM to help us put out the next release of our products. Earn points and badges for your profile! Announcements - Find community/product announcements. This blog is the home of the very popular MONTHLY MISSIONS! Earn points and prizes every month. You can participate in monthly missions and other promotional campaigns here.